My main focus has been taking items that are deemed useless and repurposing them into functional art. For example, the worn-out brake rotors I just replaced on my truck may not be able to complete their designed task of stopping a moving vehicle anymore, but they made great bases for two lamps I made out of a collection of used car parts. 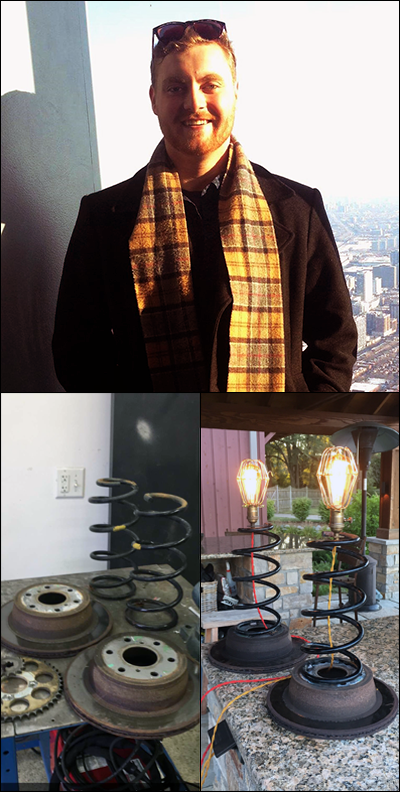 Another repurposing project I recently completed involved welding a table frame out of a bunch of square steel tubing that the local steel supplier had sitting in the scrap bin. 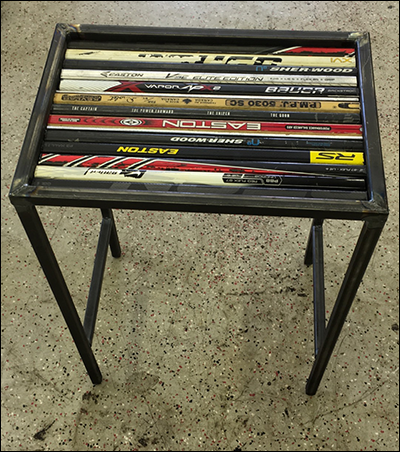 For the table top, I took a bunch of broken hockey sticks I’ve accumulated through the years, cut them down to size, and instead of sitting in the garage taking up space, they live on as a perfectly leveled table top (below). Other projects I’ve worked on this past year include restoring a decrepit steel case desk, rebuilding a broken motorcycle I bought on EBay for $300, this past holiday season I made a batch of heart shaped ornaments out of polished aluminum rod, lastly I’m making improvements to the working prototype of an invention I thought up a couple months ago. My weekdays are spent in the city working towards a management degree from DePaul’s Driehaus School of Business. Most every weekend, you’ll find me in my garage working on a side project. After a long week of studying, there’s nothing more refreshing than being creative and making something with your own two hands. Sometimes I wish I could dedicate all my time to “making stuff,” but there is immense value in also understanding the skills involved in operating a business. Once I graduate, I hope to take the make-things skill set and build a business that allows me to continue operating in the creative realm. Regardless of your discipline, the great thing about a side project is the passion involved in the process. My grandfather was the auto shop teacher at Libertyville High School for 28 years. When I was young, he let me help him with his side projects. He taught me the value in fixing things. As I grew up, fixing things morphed into making things. I’m eternally grateful for my grandpa’s influence. 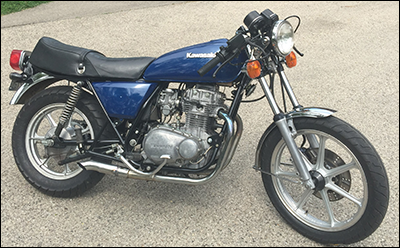 One of the most rewarding projects I’ve been involved in was the customization of my buddy Vance’s Honda CB350 motorcycle (above). Having the opportunity to include others in your creative process is an incredible experience. For readers considering taking on a side project of any form, my advice is do it! Humans are inherently creative, let that creativity flow—you’ll be amazed by what you’re capable of when you follow your passion! Images courtesy of Erik Lutz.